» A Review by Curt Evans: SAPPER [H. C. MacNEILE] – Knock-Out. A Review by Curt Evans: SAPPER [H. C. MacNEILE] – Knock-Out. SAPPER [H. C. McNEILE] – Knock-Out. Hodder & Stoughton, UK, hardcover, 1933. 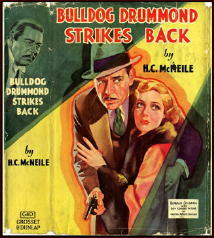 US title: Bulldog Drummond Strikes Back. Doubleday Doran/Crime Club, hardcover, 1933. Reprints: Grosset & Dunlap, hc, 1934; Triangle, hc, 1943; House of Stratus, UK, trade paperback, 2001. 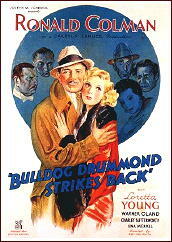 Films: United Artists, 1934, as Bulldog Drummond Strikes Back (Ronald Colman, Loretta Young; director: Roy del Ruth). 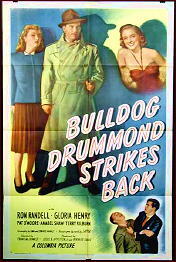 Also: Columbia, 1947, again as Bulldog Drummond Strikes Back (Ron Randell, Gloria Henry; director: Frank McDonald). English thriller writer Sapper (pen name of Herman Cyril McNeile) is a much maligned figure of late decades, his famous hero Captain Hugh “Bulldog” Drummond now being seen as less a “clubland hero” than an arch-conservative, racist, public-schooled bully. This perception is fueled especially by offensive racial comments made by Captain Drummond in some of the 1920s novels, like The Black Gang (1922) and The Female of the Species (1928). Eric Ambler represented the views of many in dismissing Sapper’s books as essentially fascist. By 1933, however, Hitler was consolidating his power in Germany and shocking much of the civilized world with his bellicose, frequently anti-Semitic, rhetoric and behavior. Sapper continued publishing thrillers up until his premature death in 1937. What was the tenor of his later works? My conclusion from reading Knock-Out (1933) is that if you are offended by it, you are pretty easily offended. Knock-Out opens with Ronald Standish (familiar to Sapper readers from the Sherlock Holmes inspired pastiches he appeared in throughout the 1930s — they should have been collected under the title Knock-Off) and his friend Bill in Ronald’s flat discussing a vital matter — golf — when a phone call from Ronald’s friend Sanderson comes through asking Ronald to come over to his place immediately. But the line goes dead! Ronald and Bill head over to Sanderson’s place, only to discover Sanderson dead, stabbed — or shot? — through the eye. Ronald’s bona fides as a sportsman established, the four good fellows are able to come together on a plan over what to do about Sanderson’s murder. It seems that Sanderson was on the trail of some sort of BIG criminal conspiracy. Of course, letting the police or intelligence service in on the “show” in any big way is unthinkable — this is a job for impetuous, sporting, public-schooled amateurs! Soon Hugh, Ronald and pals are on the hunt for the conspirators, who include a noted society doctor, a sadistic American film actress and, worst of all, a cross-dressing, bald-headed Greek man with lacquered fingernails. A number of elements from earlier tales are recycled. Hugh again indulges his odd penchant for disguise, his Wodehouseian pal Algy is made to take notes of Hugh’s deep thoughts (to what purpose is not evident), there is a loyal “old nurse” of one of the the fellahs on hand when needed and, of course, a pretty, plucky nice girl (Daphne Frensham — “an absolute fizzer”) shows up to help out the lads, as well as to engage in some light romantic banter with Peter (Hugh’s wife presumably is out shopping during this one). The heroes’ headstrong assault on the villains’ country house headquarters also will seem familiar, as will the fact that it is defended by a fearsome beast (here, a mastiff “the size of a donkey” — young apes were not available this season, evidently). Hugh also goes into one of his patented berserk rages, splitting open one filthy swine’s head and throwing another off a railway embankment, but they really were rather rotters, I will stipulate (they had committed an act of what we would call terrorism today and were in the process of attempting another one). Yet not all is pure action. The presence of the relatively cerebral Ronald Standish gives Sapper an excuse to indulge a little in the exercise of a bit of brain power. There is much speculation over exactly how Sanderson was killed and there is a cipher that plays a major role in the tale. However, during the course of the action Standish is drugged, kidnapped, kidnapped yet again and concussed by a bomb, so let us just say that his brains are not always fully operational throughout the tale. Perhaps most interestingly, Sapper takes time to present, in a quite sympathetic manner, a Jewish shopkeeper named Samuel Aaronstein, alone with his wife and son. If Knock-Out ever was reprinted in Nazi Germany — and we know Hitler liked Edgar Wallace thrillers — this section of the book would not have found favor. It should be noted as well that the sadistic American film actress who is aroused by seeing men being tortured to death is not exactly a cozy concoction. I could never quite figure out why she was necessary to the success of the conspiracy, but she certainly added a frisson of wicked decadence. So, while Knock-Out is not perhaps the most original of Sapper’s thrillers, it is as smoothly competent as any of the author’s books, and it is not as offensive as people will tell you Sapper works invariably are. Sure, the lower class characters all speak exaggerated cockney-ish dialect, the street boy with the message for our heroes is invariably referred to by them as “the urchin” (I was half expecting “ragamuffin”) and the head villain is a creepy hermaphrodite (or something like). But, honestly, you must have read more obnoxious books than this one from the period. I suspect part of the animus against Sapper has to do with the fact that the academics who write much of the mystery criticism today are precisely the eggheads who would have been made to eat dirt three times a day in public school by a young Bulldog (and don’t we know it). Though, admittedly, I too find some of the earlier books distasteful in parts. Interestingly, Sapper’s father, Captain Malcolm McNeile (1843-1901), was a naval officer and prison warden described as “a ‘rod-of-iron’ officer from the old school” and “a disciplinarian of the meanest type.” And Sapper’s paternal grandfather, Reverend Hugh McNeile (1795-1879) [FOOTNOTE], was an evangelical Anglican minister considered “unquestionably the greatest preacher and speaker in the Church of England” in the nineteenth century. With this background, it’s probably no wonder that the Sapper books are as conservative (and sometimes bullying) as they are. Whether they are “fascist” — with all that that ideology entails — is to my mind open to question, however. Conservative and fascist are not synonymous terms. Sapper’s clubland heroes may be vigilantes doing what they do “for the good of England” (which usually seems to mean people earning income off invested capital), but they often seem to find it unnecessary to inform the State what they are doing. Fascist dictators might have found them a little too anarchic and individualistic in that respect. FOOTNOTE: Reverend Hugh McNeile obtained his first living in 1822 from the wealthy banker and politician Henry Drummond. Put those names together and I think that we surely have the inspiration for the name of Sapper’s greatest hero. Poor Sapper really did get a bad knock. The idea he was a Fascist or some sort of rampant English version of a Klansman has more to do with his critics (Julian Symons has the villain in A THREE PIPE PROBLEM call himself Bulldog Drummond)than his actual fiction — that and the huge popularity of his creation which they resented the hell out of. McNeile by all accounts was a loud opinionated type who spoke and thought at the top of his voice and wrote that way too. Even in THE BLACK GANG the offending passages are only a couple of paragraphs and really not all that vital to the plot. The infamous concentration camp held unconvicted criminals and was written over a decade before the Nazi version colored our understanding of the term. It may not be politically correct but by the standards of the early 1920’s, before Hitler and when no one quit knew what to make of Mussolini, the worst that can be said is the racism is distasteful. If anything it is less nasty than some similar things found in Dorothy Sayers or G. K. Chesterton — both who should have known better. I find the Drummond books to be fun and Sapper still highly readable. His best works (he was a capable story teller and some of his short stories such as “The Man in the Ratcatcher” are quite well done while his best book is a collection of related short stories JIM MAITLAND about a monocle wearing international adventurer). Unlike Sydney Horler, who seemed to be a thoroughly nasty individual, Sapper no more deserves to be the poster boy for the distaste of the British left anymore than Ian Fleming did. His popularity and sales figures have more to do with his crimes than his actual words. No one is making any claims for literary immortality in his case, but he is still worth reading — which is more than can be said of some of the ‘lights’ of literary fiction who were his contemporaries. At worst Drummond reflected the ideas and opinions of his class of young English upper middle class sportsmen. Snobbery is a worse sin in Sapper than racism — that and jingoism. Sadly he is still embraced by some who neither Drummond nor McNeile would spare a second glance. The Ronald Colman film has little to do with the book. In the film Drummond (Colman) is a bachelor attending the marriage of pal Algy (Charles Butterworth marrying Ona Munson — and they are a delight as Drummond’s antics delay their honeymoon) as he tries to convince the Yard’s Colonel Nielson (Sir C. Aubrey Smith) that an Egyptian Prince (Warner Oland) is up to something nasty involving beautiful Loretta Young’s father. The film is sharply written and full of bright and brittle dialogue, frequently breaks the fourth wall (or almost as Colman essentially addresses the audience), and builds to a clever and exciting revelation as Drummond uncovers what the Prince is hiding (I won’t give it away, but it would still be a pretty clever plot today). BDSB is one of the best comedy mysteries of its time and with THE THIN MAN from the same year helped to make the format wildly popular. It also led to the Paramount series that debuted with Ray Milland as Drummond and then got underway with John Howard, Heather Angel, Reginald Denny, and John Barrymore as Neilson (replaced on his death by H.B. Warner). The Randell version doesn’t much bother with the plot of either the book or the 1934 movie, though Australian Randell is well cast as Drummond and ironically played an Ian Fleming style writer (the creator of ‘John Pond’) on an episode of television’s THE FARMER’S DAUGHTER with Inger Stevens and William Windom. KNOCK-OFF would indeed be a good title for a collection of Ronald Standish’s solo tales which, as Richard Usborne, author of THE CLUBLAND HEROES about Sapper, John Buchan, and Dornford Yates points out, mimic Sherlock Holmes adventures to the point if it happened to Holmes it happens to Standish — including not one, but two spectral hounds. Standish also features in TINY CARTERET, the Ruritanian adventures of a Rugby forward and all around sportsman who I suspect was a late attempt of McNeile’s to come up with a younger unmarried version of Drummond. McNeile died before he could contribute more. Standish doesn’t fare much better there than in the Drummond appearances. Oddly in this and Drummond Standish is a secret agent while in his own book he is a Holmesian private investigator. Gerard Fairlie, who continued the Drummond saga after McNeile’s death, was unique in that he was the actual model for Drummond according to McNeile. Fairlie was a successful writer on his own and had a career as a screenwriter including THE CONSPIRATOR with Robert Taylor and Elizabeth Taylor. Fairlie even managed to churn out a few wartime adventures of Drummond despite the fact at age 50 he was parachuted into Occupied France by the SOE to teach the French Resistance unarmed combat, small arms, and sabotage techniques … the sort of thing Bulldog Drummond himself might have gotten up to. Quite a few of the Drummond books and some of Sapper’s tales of the trenches of WWI and other short stories can be found on-line. Project Gutenberg Australia has a particularly good selection including the first four books of the Drummond series which comprise the duel to the death between Drummond and master criminal Carl Peterson, one of the great villains in the literature. I don’t defend Sapper’s treatment of Jews in The Black Gang. The whole tone is distasteful and unquestionably appeals to anti-Semitic sentiment. But I will point out a couple things: (1) the two Jews are designated white slavers, i. e., contemptible by their own acts–it’s not as if Drummond’s gang was randomly throwing bricks through Jewish shop windows (2) the Jews in Knock-Out are unquestionably portrayed sympathetically. So I do challenge whether the fascist characterization is quite fair. I don’t know much about Sapper’s personal life, but I am sure if he ever associated with Mosley, for example, we would know about it (didn’t Peter Cheyney?). Sapper obviously was a conservative, no doubt a reactionary one. But Knock-Out anyway is not out-of-step with the genre in its day. I’ve read much more obnoxious thrillers. I’m an egghead and not at all the type who is inclined to be partial to Drummond’s type (I get tired of the idea that a good athlete invariably has a clean character), but I can’t deny the stories have narrative zip and zest. And they obviously were hugely influential. I’m reading Horler’s first thriller, The Mystery of No. 1, and it is so obviously patterned after Sapper that it seems almost plagiarism. Also Christie’s The Secret Adversary clearly was influenced too, though she does make the innovation of having a heroine who fully shares the spotlight (if not steals it) from the hero. So was John Rhode’s The Double Florin and Laurence Meynell’s Bluefeather–I’m sure the list could go on and on. Among those who admit their debt to Sapper and Drummond were Mickey Spillane, Ian Fleming, and Clive Cussler. Doc Savage’s gang owes as much to Drummond and his pals as Drummond and company do to the League of the Scarlet Pimpernel. Even if only for writers like Eric Ambler, who reacted against him, McNeile would be important. And as Curt says his racism is distasteful, but no more virulent than much popular fiction of his age. My accounts or McNeile’s character are from his friend and successor Gerard Fairlie’s comments in his biography WITH PREJUDICE and other writings. Peter Cheyney was secretary to Moseley’s organization early on, but as far as I know out of it before any accusations of treason attached themselves to the organization. Moseley’s son Nicholas redeemed the family name and was a major literary figure. Cheyney was frequently broke before he became a successful mystery writer beginning in 1936 so it is entirely possible his association with BUF (British Union of Fascists) was as much about a paycheck as politics. As a journalist Cheyney was no doubt operating as PR man as much as anything. McNeile would clearly not have been a supporter of Moseley. While a MP from Harrow Moseley left the Conservative movement and crossed the aisle to become an Independent and then a Labour Party member. When he could not get re-elected in Harrow as a member of Labour he founded his own New Party which failed, and then, studying Mussolini and Hitler founded BUF tying together the various fascist groups and to handle the disorder at meetings his core security force of Blackshirts (mimicing Mussolini’s Brownshirts)who frequently harassed Communists and Jewish businesses and generally behaved like thugs. The Conservative and class conscious McNeile would not have tolerated either Moseley’s Labour party ties or the lower class thugs who belonged to BUF. Fascists are the villains in McNeile’s TINY CARTERET. Drummond’s Blackshirts wouldn’t have been caught dead with Moseley’s crowd much less Mussolini or Hitler. McNeile was a fairly common example of an upper middle class soldier and sportsman of his age, certainly reactionary, not revolutionary like Moseley and his fascists. Moseley by every account was a brilliant speaker and a masterful politician and ironically broke with the Conservative Party over the brutal tactics of the Black and Tans in Ireland. But his failures in politics darkened him and his ambition led him to become one of the darkest blotches on British politics. Whether he was a true believer or merely an opportunist, he and his movement would have been as much an anathema to McNeile as his opposite on the far left. The religious side to McNeile’s family history explains one of the better disguises of his arch villain Carl Peterson who appears in disguise as one of the ‘better types of clergyman.’ McNeile had more of a sense of humor and irony than he is often given credit for it would seem. My favorite moment in the Drummond canon occurs when Drummond’s antics have made Peterson ill and Drummond inquires; “Is Carl feeling a bit icky-poo?” Even James Bond never drove any of his enemies to nausea. I like the clergyman guise and knitting Irma. The only problem is I miss Carl when he’s gone. The Greek hermaphrodite in Knock-Out was just not a sufficient substitute. I actually enjoy the Standish short stories, they have a bit of a “Sherlock Holmes for Dummies” feel. But they’re pleasant pastiches. Carl is an impossible act to follow, the only time the series comes anywhere near him is Irma’s revenge in FEMALE OF THE SPECIES and the super criminal Le Bossu in TEMPLE TOWER who Drummond strangles in single handed combat at the finale. But even they are poor substitutes for Carl — who is one of the great bad guys in all popular fiction. Richard Usborne gave him a full chapter of his own in THE CLUBLAND HEROES on an equal footing with Drummond, Richard Hannay, Jonah Mansel and the rest of the Clubland crowd. Carl was well represented on film by Montagu Love, Francis L. Sullivan, Nigel Green, and James Villiers. That said Carl does get a splendid send off in THE FINAL COUNT — which is not only one of the best books in the series, but features a wide screen technicolor finale worthy of a James Bond film. I like the description of the Standish stand alone stories as Sherlock Holmes footnotes. And I agree they are fun. McNeile didn’t really steal ideas, but he didn’t always distinguish between what he had read and what he thought up himself — not an unusual flaw in a storyteller. His best book is JIM MAITLAND, written between BULLDOG DRUMMOND and THE BLACK GANG, a series of connected short stories following monocled adventurer Maitland from a deadly trap in an Australian gold mine, to river pirates, a crocodile temple on the Nile, and other adventures. Maitland later came back in ISLAND OF TERROR aka GUARDIAN OF THE TREASURE, replete with a lost treasure and a temple guarded by a lost tribe of intelligent killer apes. I loved the Drummond movies (Even DEADLIER THAN THE MALE from 1968) and when I found a book in the series I started it with some pleasant anticipation. Unfortunately, I never finished it as the character as written seemed nothing more than a big, noisy fart. No need to pull any punches, Dan! Actually, coming from the movies to the books requires a big adjustment. I first came across Drummond on the radio, where he was a suave sort of guy with a British valet and all of the rough edges polished off — and making him rather ordinary in the process. That’s my view, anyway, still having read only the first book in the series. Drummond’s kind of an oaf with all that public school sportsman stuff. I actually liked Standish better because he was more restrained. On the other hand, he’s not as memorable. But if Hugh had been fatally dispatched by the mastiff “as large as a donkey” I can’t say I would have been too distressed. One of my points was here that the books seems to get toned down about in the 1930s, for those who are worried about offensive bits in the earlier books. I will read Challenge soon and see what that is like. Oaf is being kind to Drummond, though at the time he was very modern — racing around in sports cars, quaffing beer and martinis, smoking cigarettes, and that annoying drawl and blathering all being extremely hip in the 20’s. We may think of Drummond as a reactionary old fart to follow Dan’s line, but in his day he was one of the Bright Young Things perfectly at home with P.G. Wodehouse set (both Wodehouse and Dornford Yates who wrote bright young thing fiction of a high order were deeply conservative and even reactionary right wingers). Proving nothing ages as fast as contemporary culture. Dan, I grant coming to the books from the films is a bit of a shock, but though as Curt says it is hard at times to feel much for Drummond the simple fact is he is a fully drawn character — and those are rare in any book. I can only say that you would know him if you saw him without a second glance, something that can be said of few enough fictional characters. Michael Gilbert once made the same point about James Bond, pointing out that in a room full of tall, black haired, gray eyed heroes likely the only ones you could distinguish would be Bond, Simon Templar, and Philip Marlowe. The rest would all tend to blend together. Drummond doesn’t blend. And if you get past some of the early nonsense (Curt is right, as time passed that sort of thing became less acceptable and McNeile did less of it — and he was more certain of his ability to hold the reader with his plots)there are some good things in the novels. Drummond was and is hugely influential in the thriller genre and you still see his name mentioned by modern writers when they list their influences — much more than you would think considering the books haven’t always been that easy to find. If nothing else the influence on Charteris, Spillane (who was a Saint fan too), and Fleming means we will be haunted by Drummond’s presence for sometime to come. JIM MAITLAND is much closer to the character in the Drummond films and you can easily see Ronald Colman playing the part, he is also as well drawn as Drummond, just not as well known. And McNeile was a good storyteller. He penned some fine short stories with a touch of Kipling and O Henry that are still worth reading today. He did some good ghost stories and adventure stories such as “The Man In the Ratcatcher,” “When Carruthers Laughs,” and “Fer de Lance.” It is hard for us today to realize his pre Drummond books set in the trenches were critically praised for their portrait of the British fighting man and gained him the reputation as the Kipling of the Trenches. But the shock for modern readers may be to discover Drummond and his pals were in their time bright, hip, and ultra modern young people no matter how dated the feel today. Yeah, David, I’m reading a Horler right now and it just doesn’t have the panache of a Sapper. You get the feeling that Horler was really essentially imitative (though I gather from Bill and others that some of his stuff is so ill written and loopy that it becomes classic in the alternative sense). Sapper has a Wodehousian quality that is very twenties modern, as you say. I think Sapper simply was having fun with Drummond a lot of the time. Horler, on the other hand, seems deadly serious and rather pompous as a result. 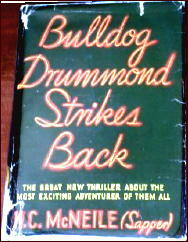 McNeile, like Drummond seems to have been a likable oaf, and clearly loved Drummond and his crew. Horler, who wanted to be Edgar Wallace so much he tried to buy his writing paraphernalia when he died, was by all accounts just an awful person and it shows in his writing. He can be fun to read in an alternative way though. A good selection of Horler titles to read would include THE CURSE OF DOONE, THE VAMPIRE ( a fairly obvious Dracula ripoff), VIRUS X (featuring his super criminal Paul Vivanti — he’s no Carl Peterson), any of the NIGHTWIND series (a cracksman who preys on bad women and writes nasty messages to them in lipstick on their mirrors after stealing from them), CHIPSTEAD OF THE LONE HAND (just to say you read a book with a hero named Bunny Chipstead), and one of his pseudo Drummond TIGER STANDISH titles. Horler doesn’t much care for anyone and was infamous for his near libelous letters to the TIMES and once starting a riot at Wimbeledon over women players in shorts (so, he’s Matt Helm?). But the books are alternative gold. If I had to choose one it would be THE CURSE OF DOONE his ‘masterpiece.’ But you may want to gargle after you read him to get the taste out of your mouth. He’s just one of the writer’s Drummond influenced in the period which include Leslie Charteris, John Creasey, Hugh Cleverly, Gerard Fairlie, Francis Gerard, Dennis Wheatley, Francis Durbridge, Sea-Lion, early Margery Allingham (some of the early Campion’s have a distinct Drummond flavor despite Campion being an anti-Drummond), and virtually the whole Thriller crew. And that doesn’t even count the writers like Eric Ambler and Graham Greene who reacted against Drummond and the whole Clubland scene. I’m going to be doing a little piece on Horler soon, hope it’s interesting! It should be, Curt, since I know very little about Horler at all. Anything written about him would be a plus, as far as I’m concerned. For your piece on Horler there is some good info on him in Colin Watson’s SNOBBERY WITH VIOLENCE. He’s an interesting character, however distasteful. “Horler for Excitement” was the tag line for his books, and he was successful enough, but more fun to read for how bad he is than how good today. He also picked feuds with several fellow writers including Michael Arlen, the creator of Gay Falcon, Gilbert Frankau (for calling his hero Marcus Orlando), and famously and nastily with Dorothy L. Sayers. Not that any of them seemed aware they were feuding with him. Mostly he was a crank they ignored. Tiger Standish is about as close to Bulldog Drummond as you can get without actually committing plagiarism, save good old Tiger makes Drummond look like a wishy washy liberal. In the Ronald Colman film, Pal Algy, played by Charles Butterworth, is marrying Una Merkel not Ona Munson.